The idea of changing your little one’s last diaper is thrilling, isn’t it? Before you get there, of course, you need to go through potty training. It’s usually not a parent’s favorite phase, but if you go into it armed with a little knowledge, preparation and enthusiasm, it may be a smoother journey than you imagined. 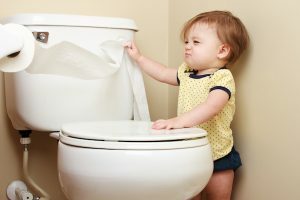 Most parents’ first question is: “When is my child ready for potty training?” We’ve got you covered with an extensive list of readiness signs here. Next, you need to know where to turn in the heavily-populated land of potty-training advice. Here’s an overview of the two main potty-training philosophies. Pediatrician TB Brazelton developed this approach in the 1960s, due to concern that parents were pushing their children to potty train and using rigid, sometimes punitive methods. CO follows a series of steps, which you can read about in detail here. CO is gradual, because your child sets the pace. You begin each new step when your child shows interest in it. If you introduce a step and she reacts negatively, you stop, give her time, and try again later. Pros of this approach are that it’s low-pressure for both your child and you. It avoids potty-training power struggles and pushing your child before she’s ready. Cons are that it may take a long time—several months or more—and that the method lacks consistency, which may become an issue if, for instance, it’s time to start pre-school and your little one is used to potty use being optional. FT was developed in the 1970s by two psychologists, Nathan H. Azrin and Richard M. Foxx. Today, countless versions of FT exist, including 3-Day Potty Training, Oh Crap Potty Training, and The Potty Boot Camp. What all of these methods have in common is that parents initiate potty training, and a short period of time is dedicated to all-out training. You can read about the basics of Azrin and Foxx’s method, which virtually all modern FT methods are based on, here. The main pro of this approach is that it generally gets the job done quickly. Nighttime training may take longer, but research shows that when parents use FT, many children are daytime trained within a day to two weeks. Cons are that it puts more pressure on the child than a CO approach, and you have to stay home, singularly focused on potty training, for at least a day (a long weekend may be more realistic). Also, because it’s a regimented approach and consistency is key, it requires preparation (learning the method, planning, etc.). Lifestyle — A CO approach may work well for stay-at-home parents, while a FT method may be a better fit for parents who work outside of the home. Personalities — CO may be a good fit for laid-back parents, while FT may be better for parents who do well with organized structure. For headstrong children, CO may be less stressful, while an easy-going child may zip through FT training. Timing — If you have a deadline like starting diaper-free pre-school, FT may a better option. The American Academy of Pediatrics advises that a cafeteria-style approach—combining recommendations from different methods—works well for many parents as it tailors the experience to their and their child’s needs. Some parents, for instance, may like the gradualness of CO but take a parent-led approach by scheduling regular potty breaks throughout each day. However you choose to potty train there are things you can do to prepare your child (even long before you start) that can set her up for success. You can read more about that here.